Herbs, perennial, to 70 cm; rhizomes absent; stolons present; corms present. 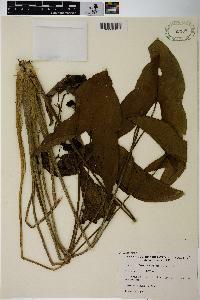 Leaves emersed; petiole terete-ridged, to 39 cm; blades sagittate, 5--20 ´ 2--8 cm, basal lobes equal to or less than remainder of blade. Inflorescences racemes or panicles, of 5--12 whorls, emersed, 25--30 ´ 6--15 cm; peduncles to 45 cm; bracts distinct or if connate, then less than ¼ total length, long-acuminate, 10--40 mm, firm, not papillose; fruiting pedicels spreading to ascending, cylindric, 1--2.5 cm. 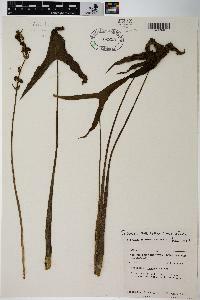 Flowers to 3.5 cm diam. 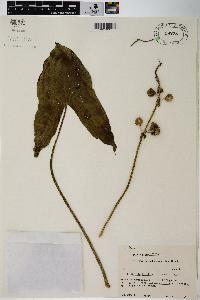 ; sepals recurved to spreading, not enclosing flower; filaments cylindric, longer than anthers, glabrous; pistillate pedicellate, without ring of sterile stamens. Fruiting heads (1.2--)1.5--2.5 cm diam. ; achenes cuneate-obovoid, without abaxial keel, 2.1--3.1 ´ 1.4--2.2 mm, beaked; faces --, wings 0--2, ± entire, glands absent; beak lateral, ascending apically, 0.4--1.7 mm. missing datum is whether faces are tuberculate or not; if datum is not easily available, change wording to near-original 'faces with 0--2 wings.' Flowering summer (Jul--Sep). Slightly basic to slightly acidic to alkaline waters of ponds, lakes, and swamps; 100---1800 m; Sask. ; Ala., Ark., Calif., Colo., Ill., Ind., Iowa, Kans., Ky., La., Mich., Minn., Miss., Mo., Nebr., Ohio, Okla., S.Dak., Tex., Va., Wis.
Perennial aquatic herb to 0.7 m tall Leaves: emersed, with a ridged stalk to 39 cm long and an arrowhead-shaped blade 5 - 20 cm long and 2 - 8 cm wide. The leaf lobes are shorter than or equal in length to the rest of the blade. Inflorescence: emersed, singly stalked along a central axis (raceme), or with loosely branched stalks (panicle), 25 - 30 cm long, 6 - 15 cm wide, arising from a main stalk to 0.8 m long, with five to twelve whorls of flowers. Flowers: either male or female, found on the same plant (monoecious), to 3.5 cm wide, with three recurved to spreading sepals and three white petals 8 - 12 mm long. Male flowers are borne on the upper part of the inflorescence, having smooth cylindric filaments longer than the anthers. Female flowers borne on lower part of the inflorescence. Fruit: a spherical cluster of achenes 1.5 - 2.5 cm wide. Each achene is 2 - 3 mm long, 1.4 - 2.2 mm wide, wedge-shaped to inversely egg-shaped, minutely shallow-toothed, with an ascending beak 0.4 - 1.7 mm long. Bracts: straw-colored, 1 - 4 cm long, linear to lance-shaped, pointed, firm, papery, separate or fused to one-quarter the length. 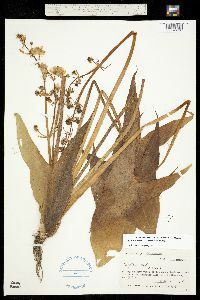 Similar species: Sagittaria latifolia, Sagittaria brevirostra, Sagittaria cuneata, and Sagittaria montevidensis ssp. calycina all have emersed arrowhead-shaped leaves and filaments lacking scales. Sagittaria latifolia has nearly all emersed leaves that are highly variable (linear to arrowhead-shaped) and achenes with beaks spreading horizontally. 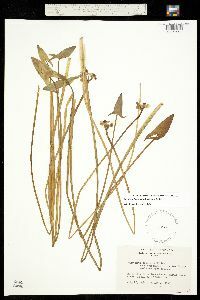 Sagittaria cuneata has submersed ribbon-like leaves, floating lance- to arrowhead-shaped leaves, emersed arrowhead-shaped leaves, and achenes with short, erect beaks. 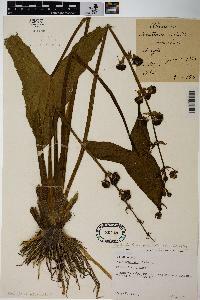 Sagittaria montevidensis ssp. calycina has linear submersed leaves, arrowhead-shaped emersed leaves, and achenes with horizontal beaks. 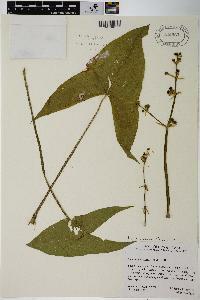 While the other species above have separate male and female flowers and reflexed or spreading sepals, S. montevidensis ssp. calycina has male and bisexual flowers. The bisexual flowers are distinguished by a ring of sterile stamens and appressed sepals. Habitat and ecology: Occasional in shallow water, marshes, sloughs, and muddy marshy edges of ponds and streams. 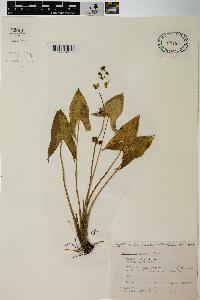 Etymology: Sagittaria comes from the Latin word sagitta, meaning arrow, referring to the leaf shape. Brevirostra means short-beaked. 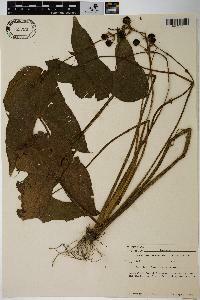 This plant is found probably throughout the state and is probably our most common species. This arrowhead is more robust than Sagittaria latifolia with which it is sometimes associated. It is found on the muddy shores of streams, ponds, and sloughs and in ditches.